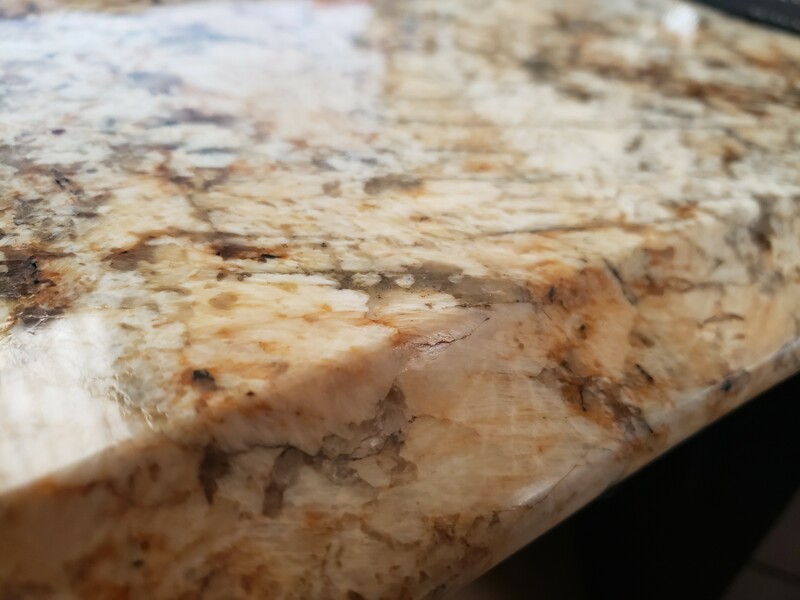 With the recent advance in CNC technology, granite and marble countertops have practically limitless possibilities for countertop edge profiles. When you are ready to purchase your countertop, you will be offered a variety of edges. Some very basic edges will be included in the square-foot or linear-foot price of the countertop. More decorative or complex edges can be added at an additional cost, which is usually nominal considering the investment you are making in the countertops. The most basic countertop edge is the straight edge. It is a squared edge, with only a very slight bevel, called a chamfer, to take the sharpness from the edges. A popular modification to this is the quarter round, where the top edge is rounded off, or the double quarter round, where both the top and bottom edges are rounded. Bullnose is a variation where the top edge is rounded more dramatically, and a full bullnose converts the edge of the countertop to a perfect half-circle. Beveled edges are also popular, and the bevel can be carved on either the top or bottom edges…or both. Fancier edges are available, usually at an extra cost to the consumer. Perhaps the most popular is the ogee. Inspired by medieval European architecture, the ogee edge consists of two graceful, sweeping arches, one concave, and the other convex. It adds an exquisite look to countertops. Other popular edges include DuPont (a straight edge dropping down to a curve), cove (a concave bevel on the top edge), stair tread (a curved undercut lip), and waterfall (three cascading convex arches). With CNC technology, though, the possibilities are limitless and unique, custom edges can even be created. “Premium” edges were originally more expensive because they took much longer to fabricate. But with CNC ultimately making an ogee edge as easy to carve as a straight edge, we should see the price of premium edges decrease. The thickness of the countertop makes a difference in which edge profiles are available, and which look best. The standard kitchen countertop is 1 ¼” (30 millimeters) thick. Luxury countertops are cut 2 ¼” (40 millimeters) thick. Some economy countertops are ¾” (20 millimeters) thick, supported underneath by a layer of medium density fiberboard. Bathroom vanities are typical ¾” thick. The more complex edge profiles don't look good on ¾” (20mm) countertops and aren't as strong. For ¾” bath vanities, it's best to choose a basic edge profile. If you've chosen an economical ¾” kitchen countertop, and still desire a complex profile, you may be able to choose a 20+20 edge option, which is a strip of stone molding glued to the underside of the countertop edge, therefore providing the illusion of a 2 ¼” (40mm) slab. However, this often costs enough extra that a 1 ¼” (30mm) countertop with a premium edge could be purchased for the same amount. Additionally, our proprietary home design technology allows consumers to play around with a massive variety of edge profiles and materials. Feel free to check out our Countertop Edge Profiler by clicking the link or checking out the Design Tools tab at the top of our navigation bar. The popular edges are, for the most part, practical for any use in the kitchen or bathroom. So the primary factor to consider when you make your edge profile choice is aesthetic. Which do you like the best? Which will compliment your space? If your kitchen is contemporary or industrial, an ogee edge will look out of place with its classic curves, and you'd be serviced better by a half bullnose or a bevel. A country-style kitchen would be enhanced by waterfall edges. And the stair tread or ogee edges would fit nicely in a modern, elegant space. Do keep in mind, though, that any crease in the edge profile may be a potential trap for food and dust, and the more creases within the edge profile, the more maintenance and cleaning the countertop will require. Ultimately, you should choose the edge profile that you like the best. Your supplier will have samples for you to look at or a website with photos and sketches. Remember that once you buy a natural stone countertop, it will last the rest of your life (and probably your children's and grandchildren's lives), so choose the edge that you love, even if it costs a little more. You'll be glad you did. Thanks for sharing the different granite edges profiles. It's important to choose the right granite edges that will complement the look of your kitchen countertop. The style and design of your countertop edge can have a great impact on the beauty of the countertop itself. I mentioned the comment below when we went to purchase our granite yesterday, yet we were told that the ogee edge would cost $372 more than the straight edge. We expected to pay more, but is it possible this edging price could/should cost less? ------- quoted from above article: But with CNC ultimately making an ogee edge as easy to carve as a straight edge, we should see the price of premium edges decrease. The Ogee edge requires a lot of time and labor to create (as does the straight edge) but not as long as it used to. However, the straight edge does not require the use of CNC machines as opposed to the Ogee. Without the proper bits and machines, we would not be able to achieve a wonderfully smooth and even edge quickly and efficiently. It only costs $15 per linear foot as opposed to several years back where it was nearly double even triple the price hence the statement “we should see the price of premium edges decrease”. The estimate you are given only estimates the amount of linear feet of edging you may need. All you do is add the amount below your edge of choice to the “edge charge” in your estimate to get the full price. But again, this is solely based on the measurements you provided and the estimated amount of linear feet of edging you may need. Once the template and final measurements are taken, we have the exact amount of square and linear feet your project requires. When you are confirming the project with us, you are given the final, total numbers. Hope this helps! Take the comparison in this sense: If we did not have CNC machinery to create the Ogee edge, it would not just cost $372.000 more one time for the whole project, it would surely cost over a thousand dollars more because of the tedious labor involved to make it perfect. We're perfectionists, and our craftsmanship shows our attention to detail. 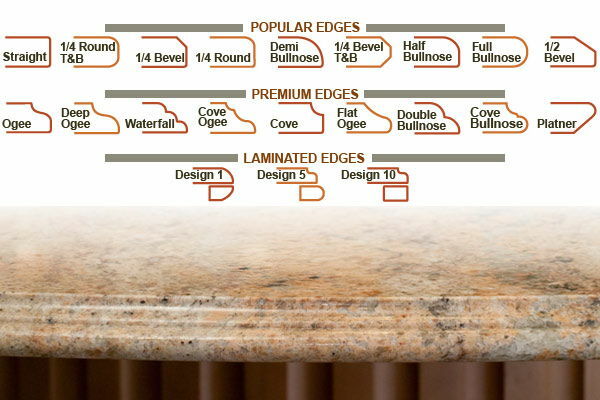 If you are referring to a double laminated edge, then that would surely add depth and fullness to the counters. However, people usually choose to do a thick edge such as this on the island to show it off, while keeping the practical 3cm thick edge throughout the perimeter. Do you have an island? Hello. Did we fabricate the hearth for you? How much overhang is typical for a marble countertop w/straight edges? i was wondering if an ogee edge could have a straight 90 corner or if ogee must have a rounded corner? It can be done, although a perfectly straight 90 degree corner would be susceptible to chipping. In most cases there would be a very small (1/8") radius. It can vary depending on preference anywhere from 1-2 inches.